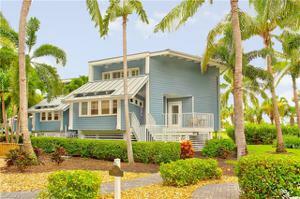 Fabulous ONE WEEK TIMESHARE unit on world famous Captiva Island. THIS IS THE SALE OF A ONE WEEK TIMESHARE WEEK #4 - UNIT 1506. Gorgeous, remodeled & updated 2 bed/2 bath corner end townhome overlooking the South Seas Resort Golf Course and the Gulf of Mexico. The Cottages are spacious 2 story townhomes with soaring ceilings & a loft. As a corner unit, #1506 has more windows and natural light. It can sleep eight guests. Enjoy breathtaking sunsets on the 2 story lanai and feel like a star living in paradise! These are the largest of all the timeshare units in South Seas Resort and have their own pool as well as close proximity and use of the large Resort Pool. Amenities at South Seas include the resort pools, restaurants, trolley, fitness room, beach chairs & umbrellas for use on the beaches just steps away! All included in the maintenance fees. Fees of $1,899.51 also cover taxes, reserves, operating expenses and ARDA. A 9 hole golf course, marina, fishing pier, tennis and other amenities are also available. Escape the cold January weather & relax in our vacation retreat here on Captiva!! Island life is waiting for you here!